Since 2005 in the pebble tiles industry, here at Stanza we guarantee that the quality of our products incomparable by any other. Headquartered in Chino, California; our stones are all natural and meticulously chosen and sorted by hand. As a result of this care, every tile that we create is a work of art -- a translation of the global human passion for aesthetics set in stone. 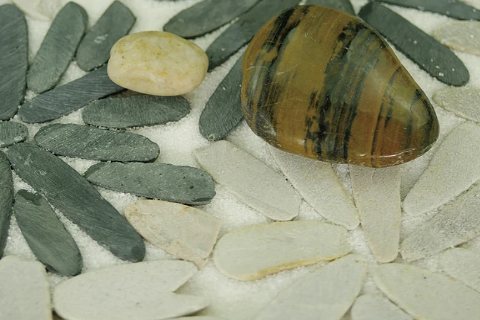 There are nearly 50 different style of pebble flooring within our collections. The Polished Pebble collection is made with polished stone. The Standing Pebble collection, which is ideal for walls, is made up of polished pebbles that are stacked. Our Flat, Jade and Designer Pebble collections are one of a kind that comes in variety of colors. All of our tiles are attached to web mesh by pollutant-free glue. By offering unparalleled service and a dynamic selection of our products, Stanza is one of the most comprehensive sources for pebble tile mosaics. Our prices are extremely competitive without compromising the quality of our tiles because our tile comes directly from one of the largest manufacturers in China. Our dedication and commitment to customer service remains the core of our business.